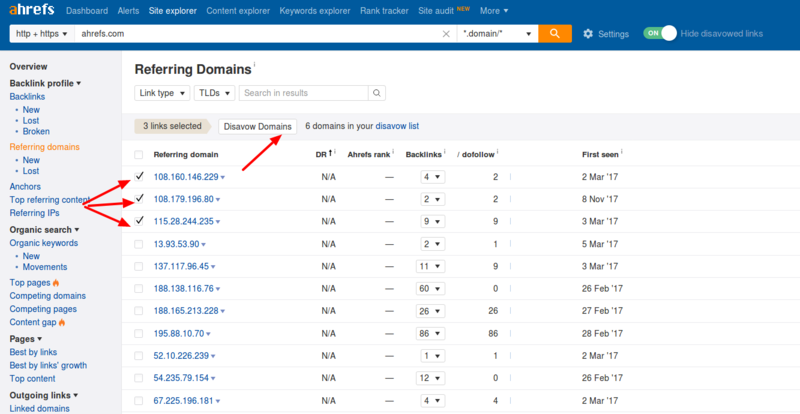 Ahrefs’ Site Explorer only helps to prepare your disavow file in a correct format. But you still need to export the list from Ahrefs and submit it to the Disavow Tool within Google Search Console. First, go to Site Explorer > Enter your domain > Explore > Referring domains and choose all the harmful domains you want to disavow from the list. Click the 'Disavow Domains' button. Once you’ve done it, return to your Ahrefs dashboard and click the ‘Disavow links’ button. It will show you the list of domains you’ve added previously. What you need to do now is to export this list in .txt format by clicking the ‘Export’ button. You’ll get a disavow file in a proper format. Your next step would be to upload this file to the Google Disavow Tool to instruct Google to ignore these harmful domains. To upload a disavow file to Google, log in to the Google account associated with your domain and go to the disavow tool. Choose your website’s domain and click the ‘Disavow Links’ button. After this, click ‘Choose File’ and upload your Ahrefs disavow file to Google. That would be it.